The amount of floating ice in the Arctic’s Bering Sea – which had long been expected to retreat disastrously by climate-Cassandra organisations such as Greenpeace – reached all-time record high levels last month, according to US researchers monitoring the area using satellites. Common blue butterflies were the biggest losers from the coldest summer for almost two decades, with numbers tumbling by almost two-thirds, experts have said. The results of the Big Butterfly Count 2011 revealed that the number of individual butterflies seen by each person counting the insects was down 11 per cent on last year. I appreciate that government bureaucrats believe that there is no world outside Washington, yet nature has given us the opportunity to grade both the predictive and observational skills of the experts. And it looks like they deserve a rather poor grade. According to data collected by Rutgers University Global Snow Lab, this past October through March period was the snowiest on record in the Northern Hemisphere – with an average monthly snow cover of 39,720,106 km2. Second place occurred in 1970 at 39,574,224 km2. – Fresh snow in Europe. – Fresh snow in New Zealand as season winds down. – Fresh snow in Australia leads some resorts to extend season. – Fresh snow for Whistler as Olympic season draws near. Forecasts of climate change are about to go seriously out of kilter. One of the world’s top climate modellers said Thursday we could be about to enter “one or even two decades during which temperatures cool. Dr. Roy Spencer announced on his blog that June’s anomaly globally using the Aqua satellite dropped to 0.001C. This continues the downtrend that started after 2001. 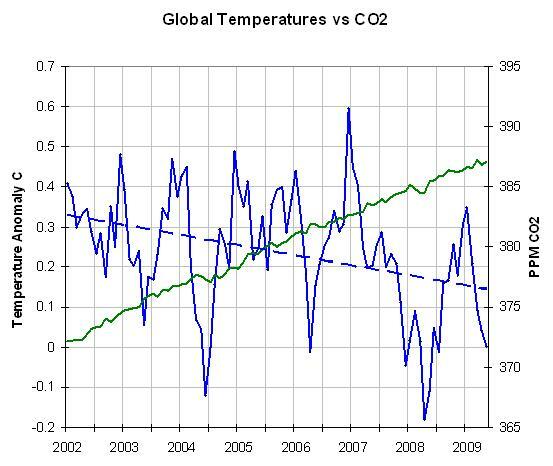 Roy notes: June 2009 saw another – albeit small drop in the global average temperature anomaly, from +0.04 deg. C in May to 0.00 deg. C in June, with the coolest anomaly (-0.03 deg. C) in the Southern Hemisphere. 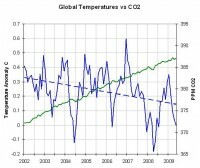 The decadal temperature trend for the period December 1978 through June 2009 is now at +0.12 deg. C per decade. (3) The progress of daily temperatures (the current month versus the same calendar month from one year ago) should only be used as a rough guide for how the current month is shaping up because they come from the AMSU instrument on the NOAA-15 satellite, which has a substantial diurnal drift in the local time of the orbit. Our ‘official’ results presented above, in contrast, are from AMSU on NASA’s Aqua satellite, which carries extra fuel to keep it in a stable orbit. Therefore, there is no diurnal drift adjustment needed in our official product. 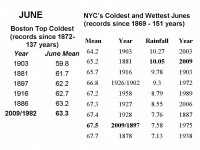 Icecap Notes: It was the 15th coldest June in the 31 years of satellite record keeping since 1979. The first half of the month was extremely cold and even snowy in south Central Canada and the northern United States. In snowed in North Dakota and in California and northern New England in early June. It was also unusually cold in the southwest – well below the normal (often 10-20 degrees) in places like Palm Springs, CA. In general, the desert southwest was unusually mild. Phoenix had 15 straight days with highs below 100F, the first time in June since 1913. In contrast feeding off the dry soils from two years of La Nina, June, especially the second half was very hot in the southern plains and the heat expanded north and east a bit after mid-month before being suppressed again by months end. In the northeast, the month was unusually cold, cloudy and wet. In Boston it was 4.7F below normal in a tie for 6th coldest June (with 1982) in 138 years of record keeping, all the other years were before 1916. It was just short of two standard deviations colder then normal. The NWS spot checked the average maximum temp at Boston for the month and it appears this is the second coldest average high temp since 1872. 1903 is the record. A trace or more of rain fell on 22 days of the month. Measurable (0.01 inches or more) occurred on 16 days just short of the record of 18 set in 1942. At Blue Hill Observatory in Milton, MA, just southwest of Boston, the month of June had between 26 and 27% of the possible bright sunshine. Normal for June is 55% and the gloomiest June in 1903 had just 25% of the possible sunshine. Second place had been June, 1998, with 36%. So, this month has taken over 2nd place, not an enviable distinction for vacationers. So little sunshine and so much cool temperatures that we have heard some reports that swamp maples in parts of Maine showing fall colors! New York City’s Central Park was also cool, cloudy and wet. The month averaged 3.7F below normal and tied with 1897 as the 8th coldest since 1869 (151 years). 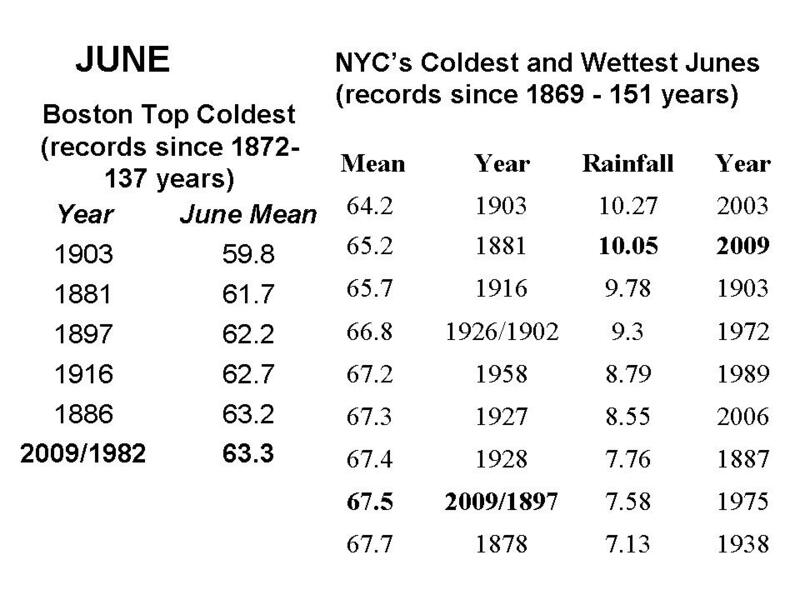 It rained in 23 days of the month and ended up as the second wettest June ever falling short of 1927. Recall Joe Romm of Climate Progress had blamed the rains at the US Open on global warming and chuckled the heat waves would make the climate debate in DC all that much more exciting. 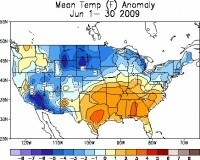 The preliminary June monthly anomaly is shown below (CPC). In other parts of the world, Southern Brazil had one the coldest June’s in decades and New Zealand has had unusual cold and snow again this year after a banner year there and in the mountains of southern Australia last year. The Mt. Lyford Ski Area is experiencing some of the best early snow it�s ever seen. With a current 135cm average base on the slopes along with 50cm of snow fall earlier this week and an additional 5cm of windblown powder last night, ski area operator Hamish Simpson says there are “plenty of fresh tracks to be had”. “We have got the best early season snow in years,” said Mr Simpson. “Even better than last year – wall to wall white! The Terako rope has 100% cover with plenty of fresh tracks to be had.” Photo Mt. Dobson. 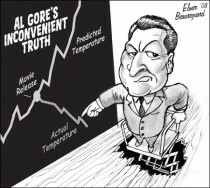 Finally from our Friends at Minnesotans for Global Warming this chart showing how since the release of the Al Gore movie An Inconvenient Truth, global temperatures declined 0.74F.